Treat yourself or someone you love to the everlasting gift of radiant Diamonds. This eye-catching classic 0.15 ct. t.w. Diamond Eternity Band features a glittering chorus of 21 genuine Brilliant Round Cut Solitaires showcased in a pave setting and crafted in glamorous 14 Karat white gold with a high polish finish. 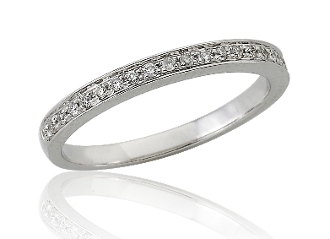 This ring may be worn alone for a classic statement, or stack alongside other bands for a true fashion-forward look. For added appeal personalize your item, select our Engrave option and indicate size needed when adding to Cart.